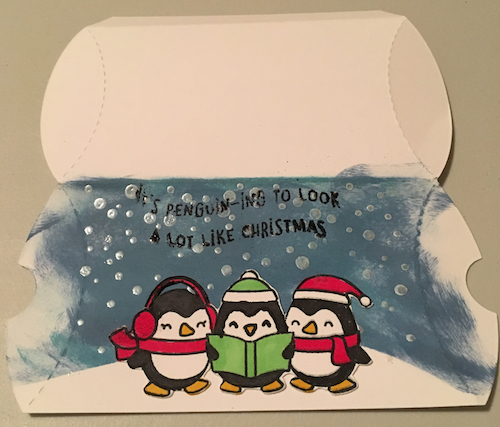 Penguin-ing to look like a gift card holder! Simon Says Stamp: Work it Wednesday August/September 2017. I must be a little rusty with my crafting skills; I made a few obvious mistakes with this one. But I like how it turned out overall. I used the gift card holder die from Lawn Fawn for the base, covered the bottom to keep it snowy, and blended Distress Oxide inks in Faded Jeans and Broken China for the sky. After removing the paper at the bottom, the snow background stamp from Lawn Fawn's "Snow Cool" was used with Colorbox White Pigment Ink and Recollections Pearl Embossing Powder in Snow, heated to set. 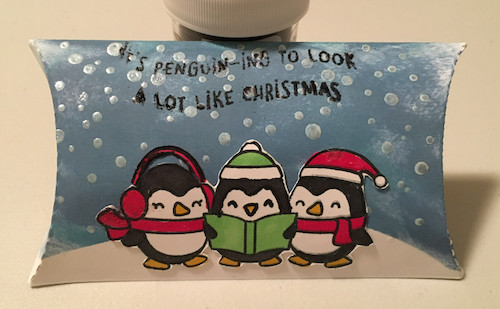 The penguins and sentiment are from Lawn Fawn's "Here We Go A-Waddling". I stamped them on white cardstock with Memento Dye Ink in Tuxedo Black. The colors used for the penguins were Spectrum Noir True Black, GY4, DR3. and LG5. After cutting them out, I glued them on and stamped the sentiment in Colorbox Pigment Ink in Archival Black. Because I didn't use my MISTI, I couldn't re-stamp when it didn't take well the first time. I still added Recollections Detail Embossing Power in Ebony and headed to set it. A little glue on the tabs and it's ready to go. 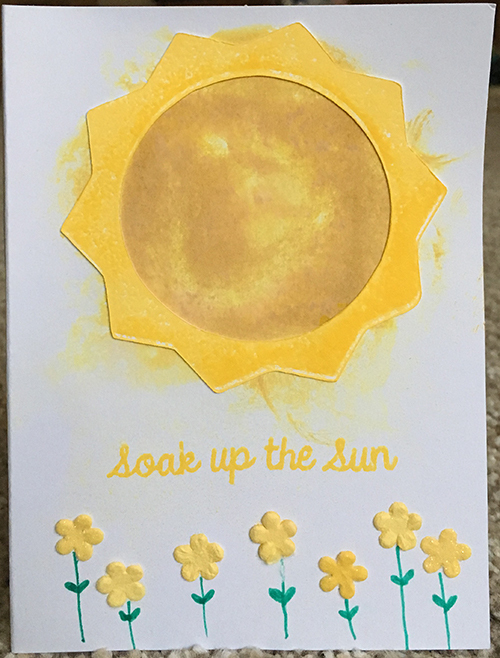 Simon Says Stamp Work It Wednesday June 2017: Summer Icons. After planning and executing a move across state, I am getting back into crafting! Unfortunately the first thing I packed and the last thing I unpacked was my papercrafting supplies, and life has also interfered with my crafting time. Details of creation to follow at a later time! My original thought was to make the gumballs in the machine a little 3-D with pop dots and leave them loose, but they kept flipping over in the shaker. So this turned out to be a mock shaker card as I ended up gluing them down. Simon Says Stamp Monday Challenge: Make Your Own Background. Start with the Versamark and stamp the gumball machine and sentiment. Dust with embossing power and heat set. Mask the gumball machine with whichever method you choose, and use the various Memento Inks to stamp a gumball background. With the same inks, stamp some gumballs on white cardstock and fussy cut them out. Remove the masks from the gumball machine. 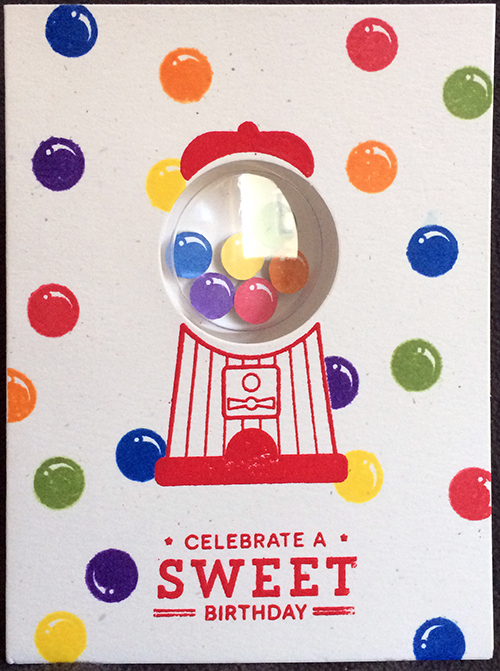 Line up the gumballs with the opening in the front of the card and pop dot them to the back of the card. Add the shaker plastic and you're set! I tried for colors as close to the given challenge colors as I could get, but I didn't quite make it. Clearly this means my crafting stash isn't big enough yet! ^_~ This particular card is full of shimmer and sparkles, but sadly those never photograph too well. The only exception to the shimmer or sparkle is the outer border of flowers, which is plain. Cut the patterned paper to 5" by 7"; cut a rectangular hole in the middle half an inch from each side. You can use the inner rectangle to cut the banner strip of patterned paper. Cut the gray shimmer cardstock to 4" by 6", again with a rectangular hole in the center, leaving a thin border of shimmer gray. Cut some of the black shimmer cardstock to a 5" by 2" piece. 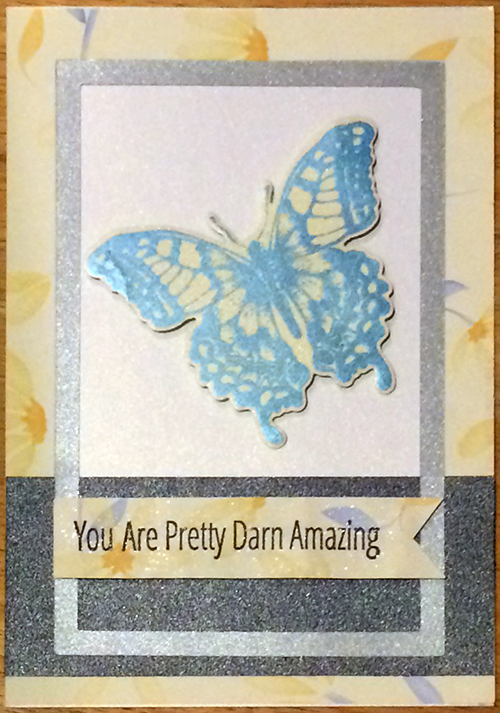 Stamp the butterfly with the blue ink and use the heat tool to dry. Die cut the butterfly. Stamp your choice of words on the banner strip of paper using the black ink, and trim the end to a fetching arrowhead. Swipe the banner strip with a sparkle pen. Glue the patterned rectangle on your card first. Next glue the black rectangle, then the gray border. Add the banner strip to the top of these with pop dots, and use pop dots to adhere your butterfly. I seem to be addicted to using pop dots; I love the dimension they add to any piece! Another angle in an attempt to show the shimmer! I have to admit, vintage and shabby chic are a HUGE challenge for me. I'm so fond of shiny and new, it's really hard to make a card look old or worn on purpose. However, I gave it my best shot this time around, and at this time of year, an awful lot of us here are dreaming of someplace warmer! and Frilly and Funkie: Out of the Cold Challenge. 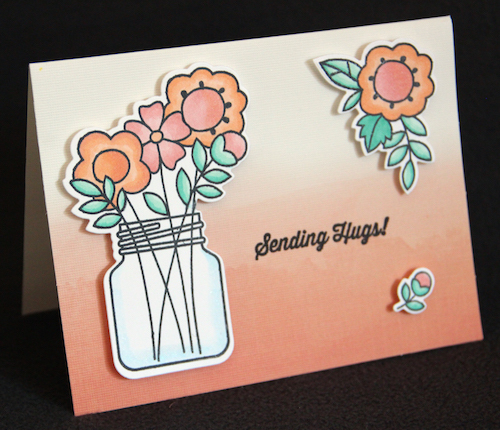 Start in the Cricut Design Space with Flower #M31CA4. The flower has two extraneous dots on it I didn't like; add a shape to that cut layer and weld to get rid of them. Resize the flower so it's just under 4" square. Using all but the largest background layer, cut each of the remaining six layers on separate colors of paper, using appropriate colors for the flower, leaves, and the patterned paper for the background. I suggest cutting the background out first and gluing the various pieces on it as you cut them out. This is easier than leaving them all until the end, although this flower's background has excellent guide marks once it's cut out should you choose to wait to glue it together. Still in the Design Space, insert an octagon shape, duplicate it, size the second octagon slightly smaller than the first, align horizontally and vertically, and use slice. Save only the outline image. Size it to just under 4" by 4" and align to a corner of the grid lines placed about how you want to see it on the card, with the bottom right corner overlapping the grid lines. Insert a square that overlaps the octagon on one side of the grid lines and use slice. Save only the octagon outline with a part missing. Repeat with a second square on the grid lines perpendicular to the first set you used. Slice and save only the part that will now be the chopped outline on your card. You'll need to use this template twice: once on the palm trees paper to form the card background, (leaving you with a thin octagon outline you can discard), and once on the patterned green paper used for the octagon, this time saving the thin outline. Once you've cut the octagon from the palm trees paper, use your paper cutter to trim it to 5" wide by 5.5" tall, making sure to line this up with the octagon in the lower right-hand corner. Cut a colored strip of paper to 1.5" by 5" for the bottom of your card, and another strip in the patterned green to 1" by 5". Stamp your sentiment on the patterned green paper with Espresso ink. Stamp three butterflies with the same ink, one on each of the two brightest flower colors and one on a scrap of the palm tree paper. 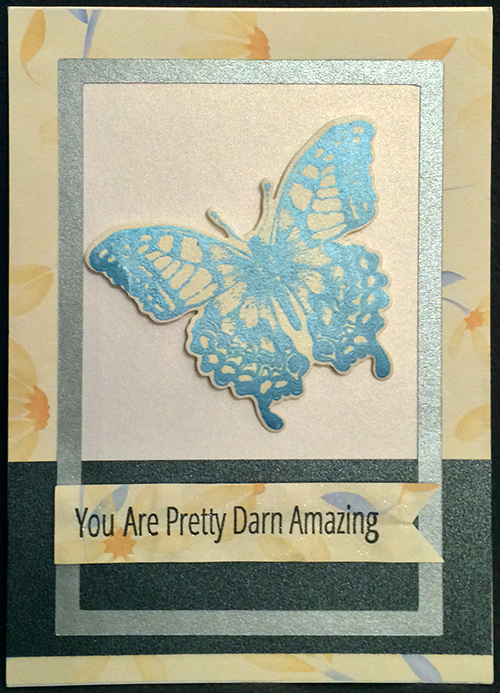 Use an embossing heat tool to set the ink on all four of these, and die cut the butterflies. Now comes the easiest part: assembly! 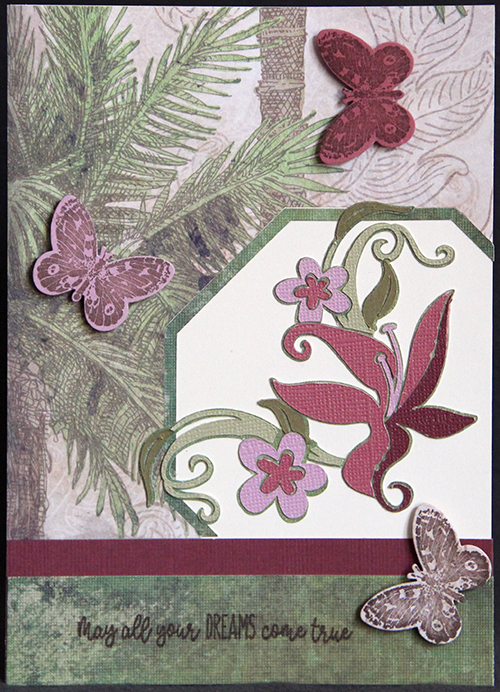 Start with the palm tree background and use the ATG to adhere it even to the upper edge of the card. Next adhere the 1.5" by 5" strip to the remaining space at the bottom of the card, and the 1" by 5" strip along the bottom edge on top of it. 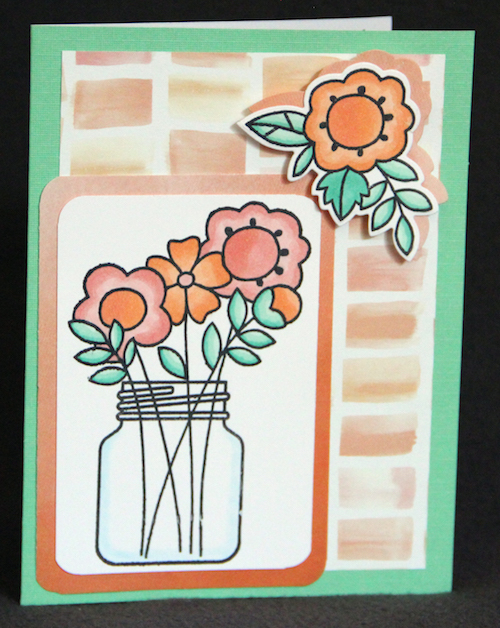 Glue the octagon edge around its open space in the card, and add the flower on top of it. Pop dot the three butterflies onto the card and you'll have a little taste of the tropics. This is a really simple card, but pretty. It was fun to make too. 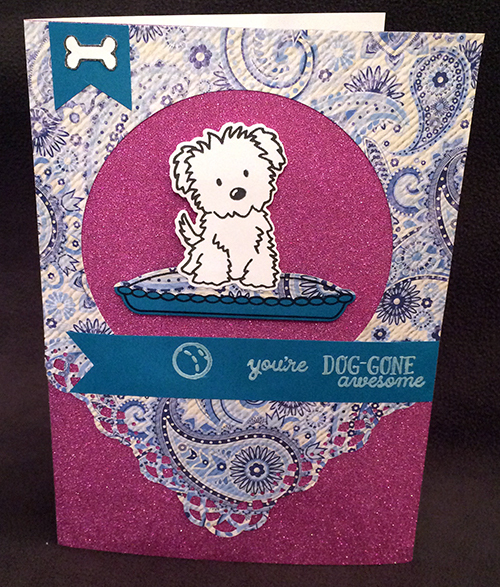 Simon Says Stamp Blog's Wednesday Challenge: Anything Goes. 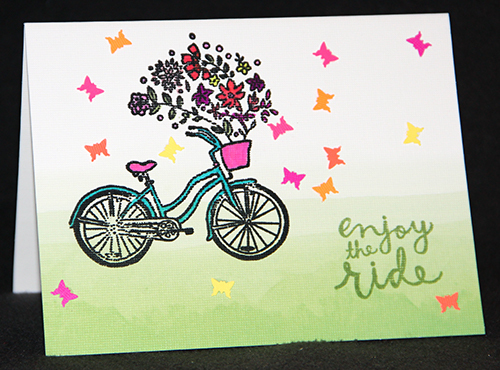 Use the black dye and stamp the green-to-white gradient cardstock with the bicycle; color in with markers. Stamp "enjoy the ride" on the opposite corner with the green ink. Punch out three butterflies from each neon color and glue in place. Enjoy the card! Paper Smooches - Best Buds Cards Cont'd. See previous post for most of other the materials. I'm really happy with how this card turned out! For a while in the middle of making it, it wasn't looking too hopeful. But I think the final card worked out well. Use the black dye and stamp the two flower pieces on white cardstock; line up your chosen sentiment in the appropriate box and stamp. 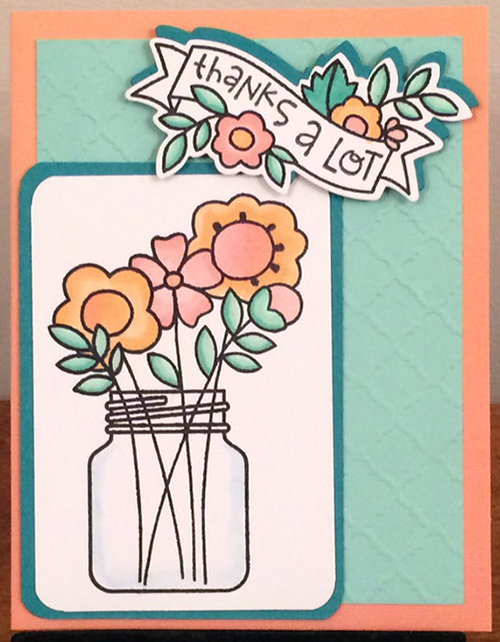 Die cut the stamped swath of flowers and the dark mint green paper with the same die. Add a bit of water to the jar with a blue watercolor crayon and your water brush. 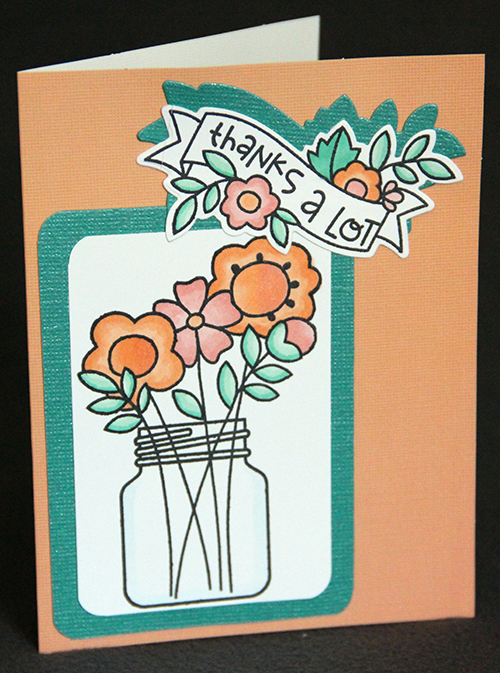 Cut the white cardstock surrounding the jar of flowers somewhat close to the edge of the stamped image in a rectangle. Use the corner rounders to trim each corner of the rectangle. Cut the dark mint green cardstock to a size slightly larger than that of the white stamped rectangle; trim the corners with the corner rounders. 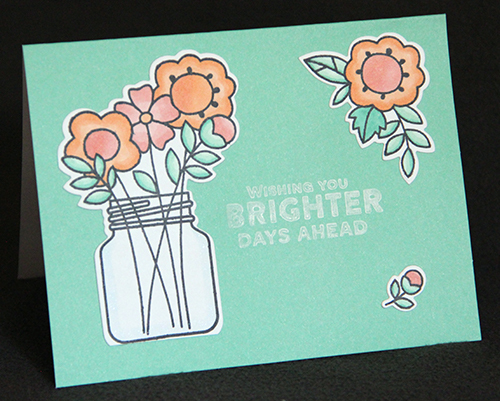 Cut the embossed light mint green paper to 1/2" smaller than the size of your card. Use the ATG to glue it in the center of the card. Again using the ATG, glue the white stamped rectangle to the dark mint green rectangle, and glue both of them to the card in the lower left corner. 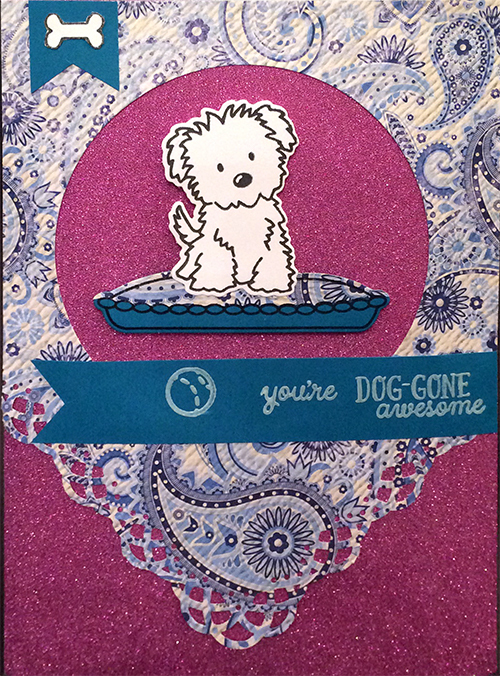 Offset slightly and glue the stamped sentiment piece onto the dark green mint shape of the same die cut. 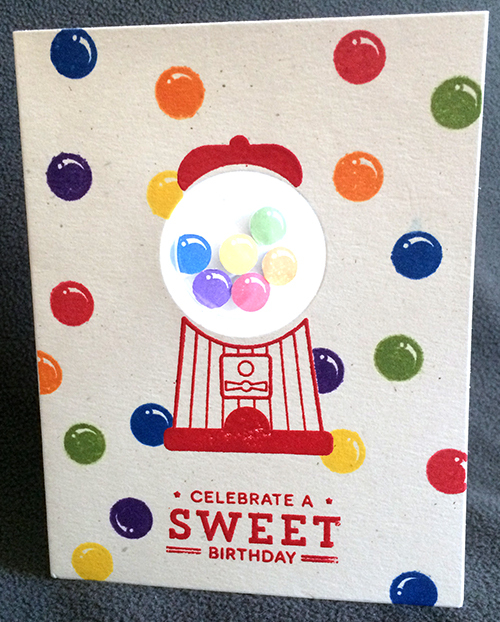 Use pop dots to affix that piece to the card for a bit of extra dimension. Wow, white is always harder to photograph than you'd think! and the card itself will be mailed to a friend of my mother's for her birthday! Although I usually have 3-dimensional flowers with Heartfelt Creations-inspired projects, in this case I need it to fit in a standard envelope. Use the Silhouette Mint to create a "Happy Birthday" greeting or use another "Happy Birthday" stamp you may own. 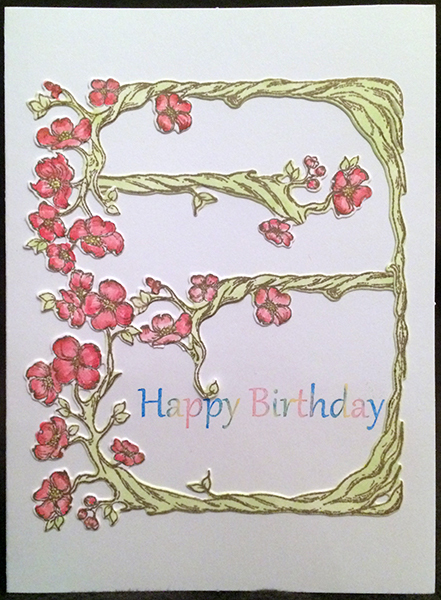 Stamp two branches with Rich Cocoa and die cut. Color the wood part of the branch with New Sprout, the flowers with Love Letter, and the flower centers with Dandelion, using your blending tool. Cut one of the branches into two trimmed pieces as shown in the pictures. Plan out the spacing for your card and stamp Happy Birthday. Glue the two branch pieces before the final, whole branch is glued. Glue that last piece to finish it up! The flowering dogwood collection arrived recently and I was looking forward to trying it out. 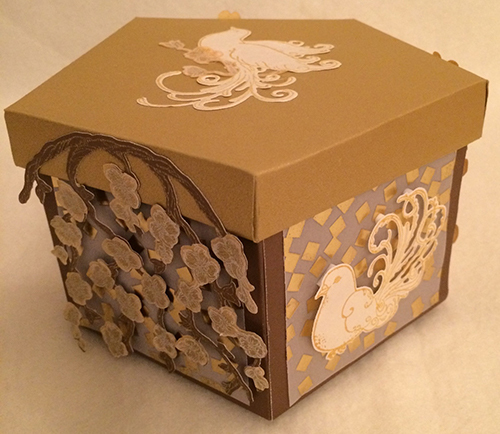 I used it on this box to create an elegant gift, even before adding the contents to the box. Sadly, the shimmer of the papers I used did not show up as well as I'd hoped it would in these photos. Watch this video https://www.youtube.com/watch?v=gI8RqHAt3vE to learn how to shape the flowering dogwood. For these particular vellum flowers, I found they looked best just using the flower shaping tool in the center to pop the petals up. 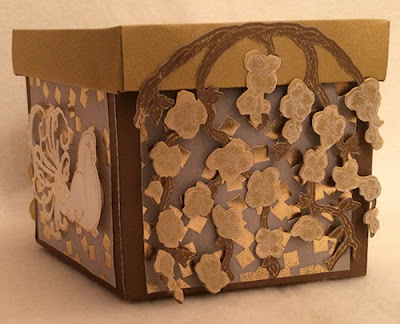 The box template is from the Cricut Design Space; search for Pentagonal Prism Box, #M934E1. If you like 3-D puzzles, this box will be fun! I was unable to find folding instructions but could assemble it based on the score lines. However, it might be frustrating for someone who doesn't like 3-D puzzles. In the Design Space, enlarge the template of the box so that the bottom is as large as will fit on a 12" by 12" piece of paper, with the lid enlarged proportionally. This will give you approximately the size of the box I used. My finished box measures 3" tall and each side of the five sides is about 3" wide. At its widest point, the box is 5". Cut the box lid from the gold shimmer paper and the box bottom from the brown paper. With the box template in hand, measure the sides of the bottom of the box. Subtract about 1/8" from one side measurement and 1/4" from the other. Use the resulting size to cut five pieces of the confetti vellum, one for each of the five sides of the box. Glue these on with small dabs of glue only under the confetti pieces; this keeps the glue from showing through the vellum. Assemble the box and its lid as per the score lines. From the Flowering Dogwood set, you will need two of each of the five sizes of dogwood blossom. Stamp these on the gold vellum with the Frost White ink. Add the embossing powder and use the heat tool to set. Die cut these out. From the Flowering Dogwood and Doves set, you need one of each dove and two hanging branches. Stamp the doves on the marbleized white paper with the gold ink; use the heat tool to set. Stamp the branch on the brown paper using the gold ink and on the gold vellum using the white ink. Heat set both of these and die cut all of these pieces with their matching dies. Take the brown hanging branch and crop to the size of the box's side. Glue to the lip of the lid over one side of the box. Fussy cut the flowers from the gold vellum hanging branch and glue to their respective flowers on the brown branch. 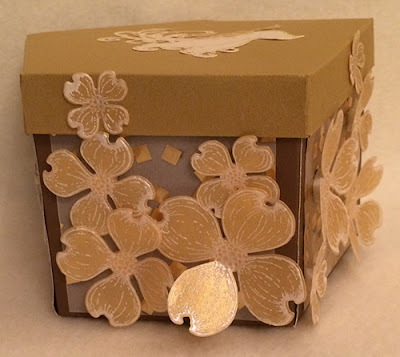 Save the extra gold vellum branch to use on the lid of the box. 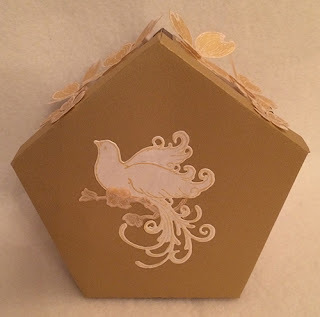 Place it partially under the tallest dove and glue both to the center of the box lid. This will give the look of the dove sitting on a flowering branch. Use pop dots to adhere the remaining pieces to the box. The doves go on the panels adjacent to the hanging branch. Each needs a couple pop dots for the body and some micro pop dots for the tails. I used one of each size of flower on the two side panels remaining. The tiniest flower went on the lip of the lid, and the four larger flowers on the side panels. With the flowers, match the size of the pop dot to the center and use one pop dot for each flower center. I found this had the effect of removing some of the pop effect in the center of the flower that came from using the flower shaping tools. Gently press each of the flowers in the center with the tool once they are adhered. This will return them to their dimensional shape. Enjoy your completed box! For this project I wanted to try a purple theme. I also had some adorable pieces from another project I wanted to use again, which worked perfectly for a forest home with woodland creatures card. Watch this video https://www.youtube.com/watch?v=Z8P070kC3oo to learn how to shape the dimensional roses. From the Classic Rose sets, you will need twelve of the smallest rose pieces and twelve of the second-to-smallest rose pieces. Stamp these on white cardstock with black ink, and color with the Memento Grape Jelly. Shape the roses as per the video and attach two of each of the roses' pieces for four-piece tiny roses. Brush the sparkle glitter over all parts of the final six roses. Using the Classic Rose Bouquet sets, stamp two rose circles with black ink and die cut. 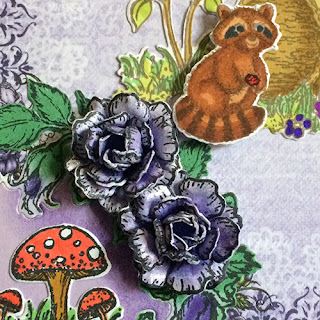 Color in the roses with the Lulu Lavender dye and add accents with the Grape Jelly dye. Color the leaves with the Cottage Ivy dye. Using the rose circle die again, cut four out of the lavender cardstock. This time use the inner pieces of the die cut and lightly shade them with Grape Jelly dye. 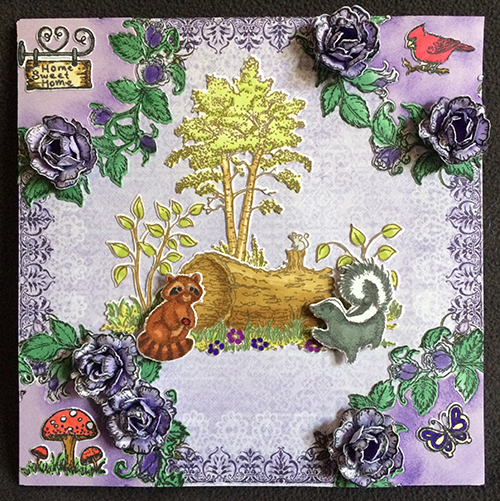 From the Woodsy Wonderland set you'll need a skunk, a raccoon, a butterfly, and the fallen log. Stamp with Espresso Truffle for all but the butterfly; stamp it in black. Color the skunk with Spectrum Noir alcohol markers in GG1, GG4, and GG5, the raccoon with TN3, TN6, TN7, and TN8, and the butterfly with TN1 and LV3. The fallen log itself is TN1, GB8, and GB9, the leaves and grass are CG2, CG3, LG2, LG5, and JG3, the flowers are LV3 and PL4, and the mouse is GG1. Die cut all 4 pieces. From the Woodsy Critters set stamp the cardinal in black and color with CR8 and CT1. Woodsy Treescape/Landscape has the tree you'll need; stamp in Espresso Truffle and color with DG1, CG2, LG2, TN1, and GB8. The "Home Sweet Home" sign is from the Wildwood Cottage set; stamp in black and color with TN1, GB9, and GG4. And lastly, the toadstool is from the Wildwood Cottage Darlings set; stamp in black and color with OR2, GB9, and CR10. Die cut all of these from their respective dies. Cut a 12" by 6" piece from the lavender cardstock. Score the cardstock at the halfway point. Cut the purple quarter off the full 12" by 12" sheet of Classic Rose paper. Adhere it to the front of the lavender card. (Note: I actually glued the final product to the card just before adding the flowers; doing it earlier would have resulted in less warping from the glue. Better to do it early!) Align a rose circle with one of the corners of the purple quarter and glue. Cut the rose circle flush with the edges of the card. Repeat with the remaining piece of rose circle at another corner. Using the second rose circle, apply the same technique to the last two corners. Match up the little edges of one of the purple rose circle inner pieces to the inside of a rose circle corner, and glue in place. Repeat for the other three corners; trim all four flush to the sides of the card. Glue one rose to each of the large roses on the rose circles; six in all. Glue the sign, mushroom, bird, and butterfly in their respective places. Glue the tree to the middle of the card front. Place the log over it and glue. 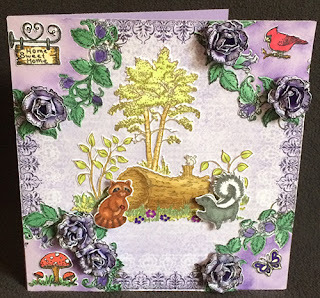 Pop dot the raccoon and skunk onto it for the final touches to this card! Note the subtle sparkle on the roses! 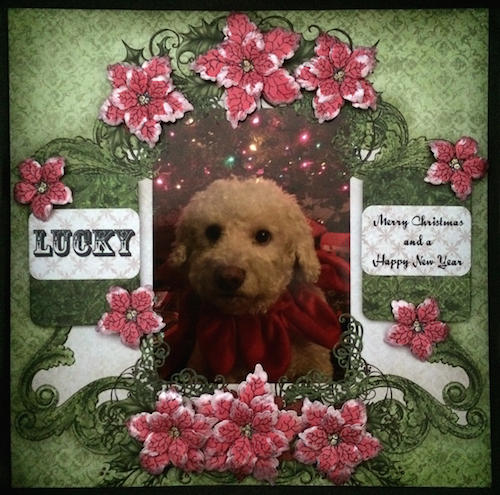 I couldn't resist using my dog Lucky in his Christmas finery for this scrapbook layout. Check out his fancy collar! Not pictured: jingle bells on each of the collar points. Watch this video https://youtu.be/1INCr0klRIQ to learn how to shape the sparkling poinsettia. Of the flower pieces from the Sparkling Poinsettia stamps and dies, you'll need ten small, five medium, and two large. Stamp them with the black ink and die cut them out. Color them with Lady Bug ink and then a light overlay of Love Letter ink, and shape them using the flower shaping tools. 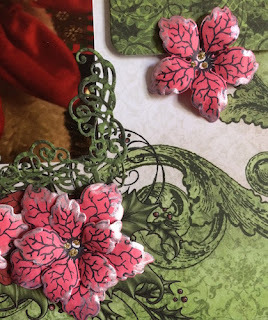 Before gluing the flowers together, add a little metallic White Pearl to the flower edges for a frosted look. After they dry and are assembled as per the picture, add 3 drops of glue to the centers and douse them in gold glitter. Die cut four detailed corners from the Cut Mat Create 2B die in the green patterned paper from the Sparkling Poinsettia Paper Collecton. You will also need two 2.75" by 3.75" rectangles and two 1.75" by 2.75" rectangles from the same paper using the Cut Mat Create 1A dies. Flip over the two smaller rectangles so the white side is showing. Stamp the pet's name on one and a Christmas greeting on the other. Start with the background paper from the Sparkling Poinsettia Paper Collection. Glue the photograph in the center of the page, just touching the poinsettias on both the top and the bottom, and glue the four die cut corners to the photograph's corners. Next adhere the small die cut and stamped rectangles to the larger die cut green rectangles as shown in the picture. Use pop dots on the backs of the green rectangles when you place them on the page. Two of the small flowers are glued on the left rectangle and another two use pop dots and are set slightly offset from the right rectangle. Place the remaining six flowers to finish this piece! Welcome to my new craft blog! Hello and welcome to my new blog. I'm excited to be starting out on this crafting adventure and delighted you've decided to join me in it. Although I've been doing papercrafting for years now, this is my first blog documenting my skills. 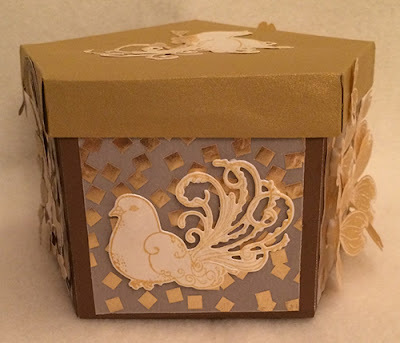 Within this blog I'll be showcasing some of my recent (and maybe not-so-recent) creations of papercrafting, as well as instructions should you want to create something similar.